Time Warner CEO Bewkes calls separation 'best outcome' for both companies. NEW YORK (CNNMoney.com) -- Time Warner unveiled plans Thursday to spin off AOL as an independent company, an end to the massive media marriage formed in January 2001. The $111 billion merger between AOL and Time Warner was applauded at the time as a visionary attempt to meld old media with new media. But synergies between the two never materialized. Time Warner's (TWX, Fortune 500) stock has plunged nearly 80% since the merger. The company's stock closed at $23 on Wednesday, down from $99.49 on Jan. 10, 2001, the day before the merger, adjusted for splits and dividends (see correction at end of story). Time Warner currently owns 95% of AOL and plans to purchase the remaining 5% stake from Google (GOOG, Fortune 500). During the past several years, as AOL has steadily lost subscribers for its dial-up Internet access business, it has made several attempts to focus on Internet advertising. 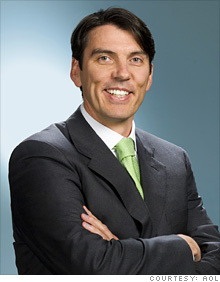 "Becoming a standalone public company positions AOL to strengthen its core businesses, deliver new and innovative products and services, and enhance our strategic options," said AOL chief executive Tim Armstrong, a former Google executive who took over in March. Bewkes described the separation as "another critical step in the reshaping of Time Warner that we started at the beginning of last year, enabling us to focus to an even greater degree on our core content business." Hamilton Faber, analyst for Atlantic Equities, said the companies are better off going their separate ways. "I certainly do think that both companies will be better off as independent entities," said Faber. "Neither company will be detrimentally impacted by not being part of the same group." Correction: According to the Time Warner corporate Web site, Time Warner's stock price on Jan. 10, 2001 closed at $99.49. An earlier version of this story listed the closing price as $115.13. Can Armstrong bring Google-glam to AOL?